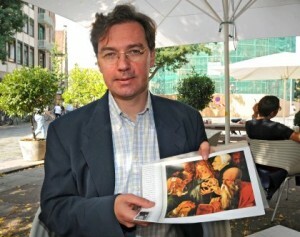 “Readers of my book should be all too aware of my questioning of the authenticity of many of the Thyssen-Bornemisza Collection’s claimed master pieces, but only now, finally, has a major art historian supported my claim by insisting that the ‘Dürer’ ‘Jesus Among the Scribes’ in the Madrid Museo Thyssen is a fake”. Translation by Caroline Schmitz of the article by Birgit Ruf in the Nürnberger Nachrichten of 02.09.2009. Thomas Schauerte, the new head of the Nürnberg Albrecht-Dürer-House and an expert on the work of the famous artist has dared to proclaim an explosive theory. He is convinced that the painting ‘Christ Among the Scribes’, a main attraction in the Thyssen-Bornemisza Museum in Madrid, is not by Albrecht Dürer’s hand. Thomas Schauerte had his first doubts concerning the authenticity of the painting – which was allegedly painted by Dürer in 1506 on poplar wood – in 2003 when he visited the big Dürer retrospective at the Albertina in Vienna. As a long-standing researcher on Dürer, who wrote his dissertation on the artist and participated in the publication of the full catalogue of his prints, Schauerte viewed the Albertina exhibition through the eyes of an expert. There, for the first time in many years, the famous painting was shown together with five existing drawings, showing details of the overall composition. It is a representation of the 12-year-old Christ in discussion with the scribes inside the Temple. “When one compares the Dürer drawings directly with the painting, one can see a crass decline in quality”, says Schauerte. Compared to the brilliant drawings the painting, he says, is “simply bad”. Clear words, which the art historian backs up by demonstrating various inconsistencies. “The head of Christ was originally planned in much too small a size”, he says and, using a reproduction of the painting, points towards a “shadowy area” where the head was subsequently “increased in size” through the addition of more hair. And in Schauerte’s opinion another mistake, namely on the scribe positioned on the very left, would “never have been made” by the great master: the noble elder is possibly 70 or 80 years old, but he has the hands of a young man – no wrinkles, no age spots, no veins can be seen. “But Dürer above all people required in his teachings that a figure has to be harmonious and that the details must all fit together”, says Schauerte. Apart from these details, he has some things to criticise concerning the overall composition as well. He says that the heads have simply been cut off at the upper edge of the painting, that the people in the work do not get into any kind of relationship with each other through visual contact and that no coherent image space is being created. Based on all these observations, Schauerte concludes: The painting is a product in the style of Dürer from the early 17th century, a pastiche, a mix of references. At the time there was a veritable Dürer-boom, so that everything that came from the master sold mit reißerischem Absatz. Therefore, those were also good times for Dürer-copyists and falsifiers. If you listen to the 42-year old, you wonder very quickly why nobody else before him noticed the inconsistencies. 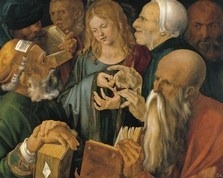 As Thomas Eser, head of the Dürer-Research-Centre at the Germanisches Nationalmuseum, confirms, no other scientist has ever raised doubts as to the authenticity of the Madrid painting, which surfaced for the first time in 1642 in a private collection in Rome and was sold to the Thyssen Collection in 1934. “The painting is not documented anywhere before 1642. That is unusual for Dürer”, states Schauerte, who recently moved from Trier University to the Dürer House in Nürnberg. When the painting was sold around 1930, “the critical awareness was not yet so much in existence”. And that people in Madrid “are not very keen to open this box” is something one can comprehend. Eser explains: “Since the painting was known, there was a consensus amongst Dürer researchers that it is a Dürer. But as it only used to hang in private collections and not in world museums, it “hasn’t been critically examined often enough until now”. Eser welcomes the fact that his research-colleague Schauerte has now done so: “He adds to the knowledge by suggesting alternative viewpoints”. Schauerte’s “heretical theory”, which he has worked six years to back up, will now be published in time for the Book Fair in the series “Dürer-Research” by GNM-Verlag (German National Museum Publishers). “The painting has no coherent spatial-narrative composition, but is, rather, a juxtaposition of Dürer-heads at close quarter”, Eser agrees with Schauerte’s observations. The latter asserts in his essay that almost all the heads of the scribes in this painting have models in other works by Dürer, but that most of them appear after the year 1506, which is the year inscribed on the tableau, next to the AD-monogram. Eser draws a very graphic comparison: “If it were a pop song, one would say it is a medley. There are many Dürer themes placed in it, but only a few bars of each of them”. Eser thinks that Dürer himself would have made higher demands as to the “coherence of the description of space.” Schauerte expresses it even more drastically and insolently: “Dürer would have been ashamed of this work”. Speaking of ashamed: That’s what the Thyssen Collection might prove to be if Schauerte is right. He has not yet spoken to the people in charge in Madrid about his “radical theory”. The Nürnberg researcher knows: “If I’m right, it would be a catastrophe for the collection”. The painting would then only be worth a fraction of its original worth. But Schauerte has also been in this business long enough to know: “It’s a very long process for new research results to become acknowledged”. 'Jesus Among the Scribes', attributed by the Thyssen-Bornemisza Museum in Madrid to Albrecht Dürer, but claimed by Thomas Schauerte to be the work of an early 17th century copyist.